Doceri engages your students by transforming the classroom projector into a moving interactive white board. In my classroom environment, I implement Doceri technology most often when teaching. Additionally, Cathy and I use Doceri to present interactive lectures to our students, record lectures for our flipped and online classes, prepare online course orientation and problem solution demonstration videos. 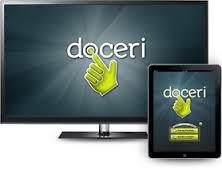 Doceri is now available for both the iPad and Windows based tablets. Doceri also offers an Educator Training Course on their website. This technology application (which includes the training course) is available for only $30.